Currently, the cold outbreak is one week away, which allows ample time for businesses and individuals to prepare. 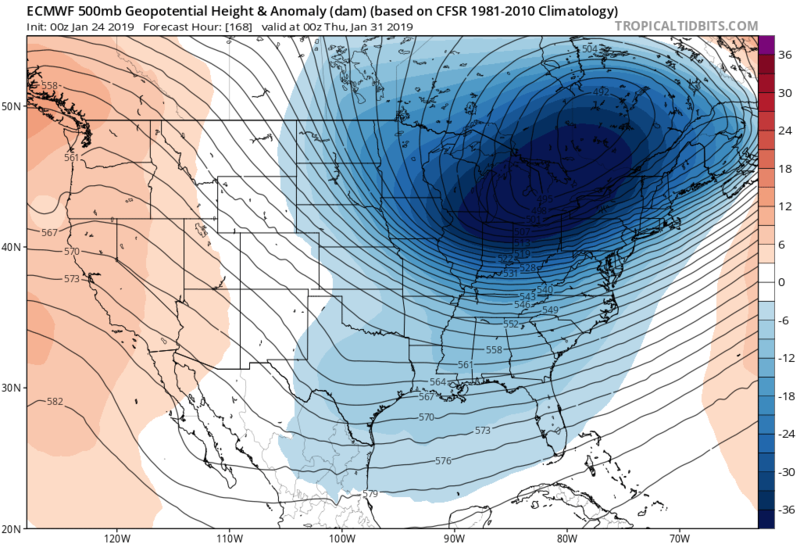 Recent data indicates a more southern push of this cold air, thanks to a strong and more southerly lobe of the Polar Vortex not previously indicated. 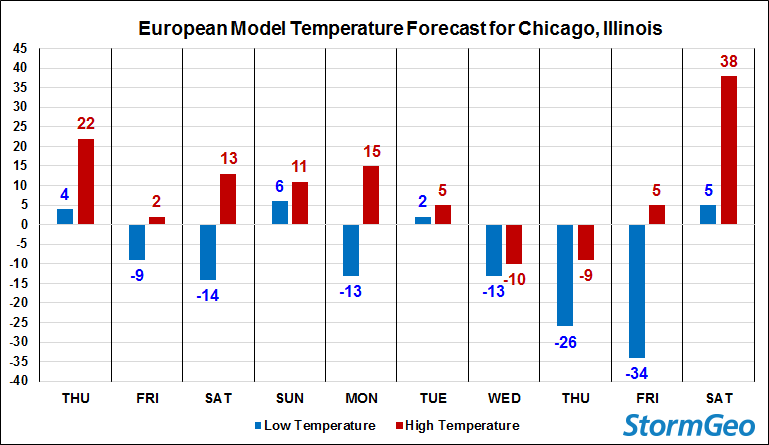 Chicago, for instance, is expected to experience daily high temperatures of just -10 F (-23 C) from January 30 until February 1. Meanwhile, broad areas across the Midwest, from eastern Minnesota to Kentucky, can expect to receive all-time record low temperatures — perhaps as low as -45 F (-43 C). Midwesterners are a hearty bunch, but this cold is beyond the typical Midwestern winter. This type of extreme cold has far-reaching effects, from danger from exposure to the elements, the increasing cost of natural gas and heating fuel (which are already peaking due to seasonality), and the curtailing of some services and logistics that involve transportation. To avoid injury, time outside should be avoided or limited as exposure to such temperatures can cause frostbite in just 5–10 minutes. Those with animals or valuables outside should heed warnings and take the proper precautions. Inanimate objects are not subject to wind chill, but this extreme cold will have an effect on vehicle operation. Businesses will also need to consider a change in operations. Outdoor activities and operations in manufacturing facilities may need to slow or halt. Chemical plants and refineries, while used to cold Midwestern winters, will likely need to prepare even further for next week’s temperatures. Insulated pipes and tanks may need additional support and consideration to withstand the cold. There is however, some good news. First, this Arctic air mass is being pushed south from extremely dry regions. This means that dew points and humidity levels are expected to be very low, and thus, widespread snow is not expected. Second, as this type of air mass is shallow and lacks the dynamics to generate a strong wind field, wind is not anticipated. Winds of 15–20 mph may be common, but the heavy winds that can accompany a strong winter storm (>50mph) are not expected. If you have a professional weather service like StormGeo monitoring your operations, check in with your online weather portal, be ready for notifications from your weather team and have them join your internal calls to provide the latest, location-specific forecasts. It’s important you stay updated, whether your weather source is the local television meteorologist or a team of experts like StormGeo. Conditions in your area can change, so make sure you’re aware of those changes so that you, your family and your employees are properly prepared.